You might not want to think about how you'd pay for an assisted living facility or nursing home stay when you're only in your 50s. After all, the days when you might need long-term care still seem far away. According to insurance company Genworth, the median monthly cost to stay in an assisted living facility in the United States is $3,750. That's a lot of money. This high cost can make assisted living — or other long-term care facilities — too expensive for many who need their services. Medicare can't help you with assisted living, either; Medicare only pays for up to 100 days of care in a nursing home or skilled-nursing facility, and you'll first have to spend three days in a traditional hospital before being referred to the nursing facility. And Medicare will never pay the costs of a continuing-care retirement community or an assisted living facility. Medicaid might pay for some of the costs of an assisted living facility or continuing-care retirement community, but the amount it pays will vary by state. And people must meet strict income and eligibility requirements to qualify for this financial assistance. Since Medicaid is a program designed to aid the impoverished, it will only kick in after the resident has spent nearly all of their own assets on a stay in a home or long-term care facility. This is where an insurance plan can help. Long-term care insurance reimburses policyholders a daily benefit to cover a variety of medical services. The cost of this insurance varies depending on your age when you take out the policy, how much your policy will pay out per day, and whether you choose any optional benefits such as inflation protection. The American Association for Long-Term Care Insurance estimates that a single 55-year-old with a policy providing a daily benefit of $150 over a maximum of three years can expect to pay about $2,007 a year. A couple the same age who opt for the same amount of coverage can expect to pay an average combined cost of $2,466 a year. But premiums can increase. While an insurance company cannot raise the premium solely on an individual, it can raise premiums for a group of people with similar characteristics. Read your policy carefully and make a tentative plan for what you might do if your rates go up. The cost of long-term care insurance jumps significantly as you get older. The American Association for Long-Term Care Insurance estimates that a couple, both age 60, can expect to see costs jump to an average $3,381 a year for the same amount of coverage. That's over $900 a year more than it would have cost when they were just five years younger. If you're younger, you're also more likely to qualify for good health discounts from insurers. The association said that in 2010, the most recent year for which stats are available, 46 percent of people age 50 to 59 who applied for long-term care insurance qualified for a good-health discount. Only 38 percent of applicants from the ages of 60 to 69 qualified for these discounts. Again, read your policy carefully to see whether your discount could be rescinded if your health should fade. As you get older, your odds of qualifying at all for long-term care insurance drop. That's because insurers won't provide this coverage to applicants who have serious health issues. The association reported that in 2010, insurers denied 14 percent of applicants from the ages of 50 to 59. They denied 23 percent of applicants from the ages of 60 to 69. Long-term care insurance isn't right for everyone. If you don't have much in retirement assets, you might be able to pay for long-term care through Medicaid, a government program that was designed to help seniors who don't have much money. If you don't think you'll meet the requirements to qualify for Medicaid, you might decide that long-term care insurance is the best choice for you. Make sure to talk with an elder-care attorney who can help you navigate your options. 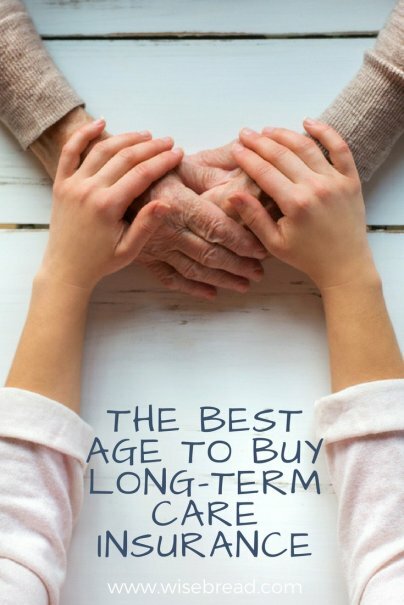 If you find that long-term care makes the most sense, taking out a policy when you're in your 50s is the best move.